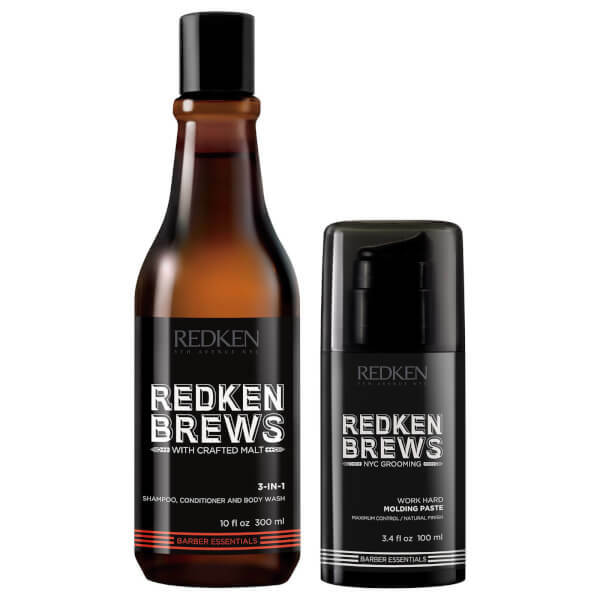 Look and feel your best with Redken Brews Men's Shampoo and Molding Paste Duo; two of the brand's favourite grooming products that deliver high-performance results. Infused with nourishing Malt, the lightweight formula works as a shampoo, conditioner and body wash in one convenient product that is perfect for use at home or on-the-move. Deeply nourishing and strengthening, you will be left feeling refreshed and rejuvenated from head to toe. A high hold formula that combines unrivalled pliability with maximum staying power. Infused with polystretch fibres, the non-greasy paste allows you to create your desired style with ease; it adds texture and definition, whilst delivering firm, yet flexible control with a natural finish. Shampoo: Apply generous amount over wet hair and body. Rinse well. Paste: Rub a small amount in hands and work through damp or dry hair. Shampoo: Aqua / Water / Eau, Sodium Laureth Sulfate, Disodium Cocoamphodiacetate, Glycerin, Parfum / Fragrance, Sodium Methyl Cocoyl Taurate, Sodium Chloride, Sodium Benzoate, Hexylene, Glycol, Disodium Edta, Salicylic Acid, Polyquaternium-7, Hexyl Cinnamal, Limonene, Linalool, Citrus Aurantium Dulcis Oil / Orange Peel Oil, Geraniol, Hydrolyzed Malt Extract, Ci 19140 / Yellow 5, Faex Extract / Yeast Extract / Extrait De Levure, Ci 15510 / Orange 4, Sodium Hydroxide, Citric Acid. Paste: Aqua / Water, Peg-40 Hydrogenated Castor Oil, Dimethicone, Petrolatum, Vp/Va Copolymer, Stearyl Alcohol, C20-40 Alkyl Stearate, Ppg-5-Ceteth-20, Tribehenin, Butylene Glycol, Phenoxyethanol, Peg-150 Pentaerythrityl Tetrastearate, Potato Starch Modified, Parfum / Fragrance, Sorbic Acid, Methylparaben, Propylparaben, Guar Hydroxypropyltrimonium Chloride, Disodium Edta, Hydroxypropyltrimonium Hydrolyzed Wheat Protein, Benzyl Benzoate, Linalool, Limonene, Peg-90m, Benzyl Alcohol, Citronellol, Fumaric Acid, Coumarin, Geraniol, Bht.